This is a guest blog written by Bethany Gugliemino, a Museum Studies MA Student on a work placement with the UCL Teaching and Research Collections. Hello! My name is Bethany and I’m a museum studies student here at UCL. 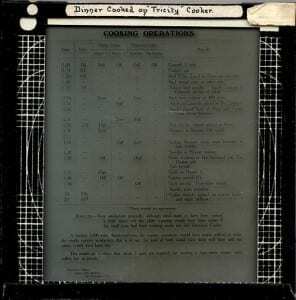 I’m currently completing my work placement with the UCL Science and Engineering Collections, specifically working on the collection of magic lantern slides held in the Electrical Engineering collection. You may remember reading about these slides before on the blog when a previous intern began cataloguing the collection. Since those posts covered what lantern slides are and how they’re made and an overview of the main contents of the collection, I thought I would give you some examples of my favourite slides I’ve found so far. 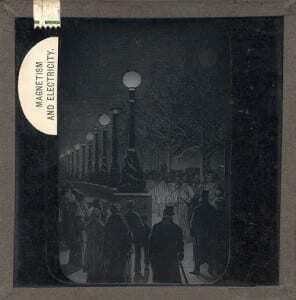 This slide shows an illustration of spectators marvelling at the installation of electric lighting on Victoria Embankment. The lighting was installed in December 1878, and this illustration comes from the January 1879 edition of The Graphic, a weekly illustrated newspaper published from 1869-1878. The lights are Yablochkov (or Jablochkoff) candles, a type of electric carbon arc lamp developed in 1876 by Pavel Yablochkov. 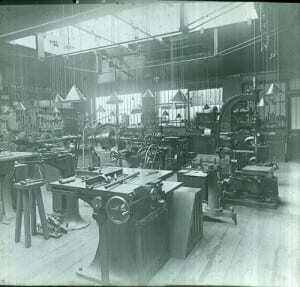 The label on this slide reads ‘Sir D. Salomons Electrical Workshop.’ David Lionel Salomons (1851-1925) was an active scientist and science writer, and the photograph in this slide shows one of the many laboratories he set up in his home Broomhill, north of Tunbridge Wells. Salomons carried out a variety of experiments with electricity, and he also built a ‘Science Theatre’ where he could demonstrate experiments and hold magic lantern shows. Broomhill was also one of the first homes to be lit with electricity. Today it is preserved as a museum and function venue called Salomons Estate. Slide EE1607, 1000 Amp Moissan Furnace at N.P.L. 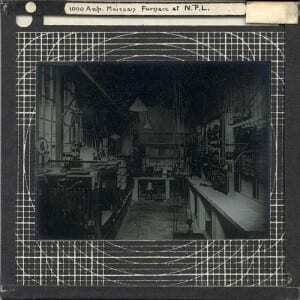 The photograph in this slide captures a view of a furnace at the National Physical Laboratory at Bushy Park. Text on the reverse of the slide explains that this is a ‘1000 Amp Moissan Furnace, by Marryat & Place.’ Henri Moissan (1852-1907) was a French chemist who developed an electric arc furnace in 1892 that he used in his chemical research. The National Physical Laboratory was established at its current location in 1900 and since that time it has been responsible for national measurement standards as well as carrying out research in many areas including physics, electricity and magnetism, and radio communication. This is only a small glimpse of what you might find in this slide collection. As someone with a background in art history, the slides of scientific charts and diagrams presented a challenge at first, but as I’ve become more familiar with the collection I’m constantly learning and understanding more of them. 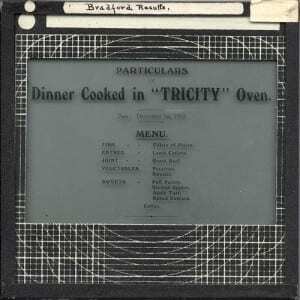 I enjoy coming across slides like the ones in this post because they reveal the people involved in and affected by the science, whether they’re witnessing early electric lighting in the streets or learning how to use electric ovens to cook their meals. I’m looking forward to seeing what else I discover as I continue working with this collection! Bethany Gugliemino is Museum Studies MA Student on a work placement with the UCL Teaching and Research Collections.